At the opulent Waddesdon Manor, former weekend home of Baron Ferdinand de Rothschild, they’re not known for doing things by halves. This year’s spectacular Christmas event is quintessential festive perfection, like a winter wind whipping through the pages of a storybook. 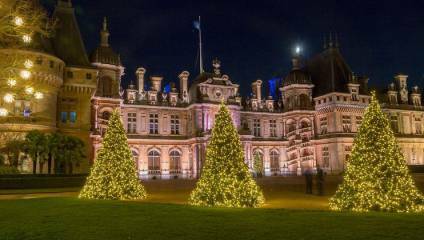 If you’re looking to dive into the ultimate Christmas fairytale, then Waddesdon Manor in Buckinghamshire is the place for you. A winding driveway leads you through looming woodland (when the property was built in the 1880s, mature trees were planted to increase its sense of history) before Waddesdon Manor emerges, magnificent, on the hill’s brow, like something from an old Hollywood movie – right on cue. The house was built in the style a French Renaissance château, and with twinkling Christmas trees and market stalls spread out in front of it, it’s quite frankly an Instagrammer’s dream. Expect to be slowed down by plenty of perfect selfie opportunities – including a beautiful Christmas tree installation made of empty wine bottles, which, though magnificent, could easily be missed in front of the resplendent Victorian property. As the sun sets, around an hour and a half before last entry to the house, the building is brought to life with pulsing multi-coloured lights and traditional Christmas music. The 2018 theme is Carnival, which cleverly draws on the extraordinary collections of books, prints and drawings held here at Waddesdon, and seems a natural fit for somewhere with such a legacy for entertaining – with royalty, politicians, actors and writers all having passed through Waddesdon’s doors. Following in their footsteps, visitors can wander through room after room of sumptuous Yuletide decoration, encountering ten 15ft pine trees, swathed in over 10,000 pea lights and 3,000 baubles. They’re so huge and immaculately decorated, you’d be forgiven for assuming they had arrived there by magic (and not the six people it took to carry each one through the Manor, negotiating spiral staircases and delicate interiors). The East Gallery invokes Venice, and the great traditions of Venetian Carnevale, with two magnificent paintings of the city by Guardi and a Christmas tree with Harlequin baubles. Meanwhile, The Breakfast Room harks back to December days of the 1930s and 40s, when James and Dorothy de Rothschild were living in the Manor. Quite unexpectedly, the route through the Manor heads down a spiral staircase where all attempts to match the mood of the existing interiors dissipate, and it feels like a dressing-up box has been sent tumbling down the stairs, opening a neon rabbit hole. Vibrant coloured fabrics and suspended stars provide a jolly little interval, which will no doubt liven up any flagging small children, before you re-emerge in the Armory Corridor. With intensely red lights glowing in the equally red corridor, this section takes its decorative inspiration from gunpowder and fireworks, as well as images from the collections, such as Jean Le Pautre’s Fireworks on the canal at Versailles (1676). Out in the fresh air, the carnival procession continues into the trees, snaking through the grounds into trees that sing and shimmer with ever-changing light displays. Don’t miss your chance to fire a “light canon”, which gives the illusion of firing a shard of light that blooms in a luminous “explosion” in the trees on the other side of a clearing. Down at the Stables, a mesmerising projection, designed by students of the Guildhall School of Music & Drama, brings the end wall of the stable block to life in a perfect finale, weaving together the themes and unique pieces of artwork that have featured throughout the experience. All that’s left is to turn and head for the bus, which leaves from just by the projection area, winding you back through the trees to land you with a gentle bump at the car park on the edge of Waddesdon village. And as you leave, all that’s left is for you to wonder – was it all a perfect Christmassy dream?